"Whatever you can do, or dream you can do, begin it. Boldness has genius, power, and magic in it." Distant shouts mixed with ripping winds as Xaver Bongard and myself established our last rock belay on the rim of the Great Trango Tower in the Karakoram. Below our feet lay 4000 vertical feet of beautiful granite wall; above, a few pitches of mixed snow and ice climbing which led to the center of our universe for the preceding months, the once elusive but now so near summit. A mixture of luck, tenacity, alpine climbing and big-wall skills, and a fine tuned logistical plan got us there. The shouts grew louder and were recognizable in syllables. "RAID DEE OH!" It was our Swiss expedition companions, Uli and Studi, who had opted for a climb on the nearby Nameless Tower, and who were now half way up its 3000 foot southeast face. So we switched on our two-watt FM transceiver, and expected to hear congratulations on our reaching of the rim. Instead, we broke into a radio conversation between Studi and Ace Kvale, who was stationed on the glacier far below: "Uli's ankle is shattered. He fell 20 feet onto a ledge. We're f---ed!" Then Ace: "Are you sure?" Disbelief and shock was evident in his tone, and the same could be said of our thoughts. Needless to say, Xaver's and my elation of reaching the rim was also shattered, as we pondered the grim possibility of having to retreat to aid in the rescue of friends. We had struggled for so long to get there, having spent the preceding 15 days and nights on the vertical wall, with the summit so near. Without committing to a decision either way, we rappelled to our bivouac gear hanging four pitches below and left our ropes fixed in place to the rim. With night approaching, we spent our fourth night in our hanging portaledge at our highest camp. We had survived the preceding three days and nights in a violent Himalayan storm, buffeted by high winds and pummelled by falling ice and debris. That morning, we awoke to clear skies, chopped our gear out of the layers of frozen ice, and finished our climb to the rim. Our cramped and icy high camp at 19,500 feet above sea level was quite different than the hot and dusty conditions in Rawalpindi, where this adventure began. Nearly two months before, on June 10, 1992, in blistering heat, I arrived at the Islamabad/Rawalpindi airport with a cumbersome load of two giant haulbags, an expedition duffel bag, a daypack on my back and a portaledge under my arm. At the Paradise Inn, a cheap Rawalpindi hotel whose name didn't really reflect its accommodations, I met with Toto, Francois Studiman ("Studi"), Uli Bühler, and our expedition photographer, Ace Kvale. Anxious to get our expedition under way, we made a plan of attack for necessary business in the city. Optimistically, we planned to move up to Skardu in a bus the next day or two, but we were in for a few surprises. It turned out that we had arrived on Ede, the start of a major Muslim holiday celebrating Abraham's faith sacrifice of his son some years back. By an act of Allah, Abraham's son was replaced by a sheep in the nick of time. Everyone's hands seemed to be discolored by some strange disease, but later, we saw some bloody sacrifices of sheep in the streets and the Pakistanis ceremoniously rubbing the blood into their hands. The shops were closed for the holiday and we realized that we would have to adjust to a new (slower) pace in getting things done. In the meantime, the Rawalpindi newspaper ran a story on our trip, impressed with the photos we passed around of our intended route. The article was titled "Big Wall Climbers Ready to Meet Danger", and described our variance from the traditional big mountain climbing style that is familiar there. After the 3 day holiday, we changed money, met with our required army Laison Officer, Mucktar, and our cook, Ibrahim, shopped for basecamp kitchen gear and food in the wild and dusty bazaars, organized our bus ride to Skardu, and dealt repeatedly with the bureaucracy in Rawalpindi. Everything had complications which kept us in the city for a week. We were lucky: an American/Russian expedition to K-2 had been stuck in Rawalpindi for three weeks. Bureaucratic frustrations can certainly drain motivation and financial resources to the point of determining the eventual success or failure of an otherwise well planned and skilled expedition. We watched the K-2 team scramble as we scrambled ourselves to get the expedition underway. We traded stories of our respective Laison Officers, volunteers from the army with generally zero experience in the mountains, and who are traditionally a ball and chain to expeditions. Mucktar (who we later nicknamed, "the Kid", enabling us to talk about him in his presence) was a hard one to please. We were required to outfit him with an archaic list of 33 items specified by the ministry of tourism, and he held up our final permission until we procured the final items: 2 "worsted shirts" and his pair of "foot gloves". When our bus was finally packed and ready to go, we were all quite interested to get out of the heat and chaos of Rawalpindi. We were told it was a 18 hour bus ride to Skardu. Our magic bus, technicolored to make Ken Kesey proud, and complete with a variety of blaring horn-sounds, seemed a fine steed as we tore out of the city and into the country. Morale and confidence were high. When the bus ran out of gas ten hours later and with a major nationwide diesel shortage underway, it again seemed we would never get to those coveted Himalayas. Mucktar was starting to look helpful after all and tried to get some diesel from a nearby army post, but to no avail. We declared the Pakistanis: "Masters of Hangology" because they had an incredible knack for gathering around at a moment's notice to hang out; often, we were the center of things. Later, diesel arrived by truck to the now huge armada of waiting trucks and buses and we were soon again off. At every military checkpoint (of which there were many), we were detained for prolonged periods for passport info and general inspection. Possibly we were spies carrying supplies to the Indians, with whom the Pakistanis were fighting in the nearby Kashmir. Captain Mucktar relished in the formality of each checkpoint and baited the enlisted men. Later we ran out of gas again, but we were having none of it and the driver concocted a diesel substitute from motor oil and kerosene and we were on the road again. Perhaps inspired by our eagerness to get to the mountains, our bus driver hair-raisingly drove an continuous 24 hour shift, fast and wildly along the third world mountain roads. After many tea stops, consuming Chai and dubious looking edibles, and outrageous scenery along the mighty river Urdus, we finally pulled into the town of Skardu, 36 rough hours after leaving Rawalpindi. Skardu is the capital of Balistan, the northerly province of Pakistan in which the bulk of the Karakoram lies, and seemed a paradise. Clear skies, cool temperatures, and none of the hustle and crazed bustle that we were familiar with in the city. We packed our 1.25 tons (2500 pounds) of expedition equipment and food into 55 pound packages (the maximum the porters will carry), and hired 3 jeeps. Again we were confronted with the lack of diesel--"Tomorrow we find diesel, Inshallah", but after a few days we set out for the ten hour jeep ride to the small village of Askole, the last outpost of civilization and the gateway to the Karakoram. At first we were glad to hear the Pakistanis with whom we were conducting business with, frequently add "Inshallah" to statements, which we assumed translated to "In the name of Allah". We were impressed with their calling for their god to help us with our travels. For example, when queried about the condition of the jeep road to Askole, they would respond "passable, yes, Inshallah". Later, we understood clearly that "Inshallah" really meant "maybe, maybe not", with the literal translation of "if Allah wills", and viewed such amended statements with suspicion. In Askole, we hired and arranged loads for the 46 porters, and began our 3 day, 50 mile trek into the mountains. The beauty of the mountains and the outrageous scale of everything kept us distracted and stumbling over our toes as we plodded along. We were amazed at the tenacity of the porters, who hiked in the cheapest of cheap plastic shoes, carried their bulky loads strapped to their backs with the thinnest of thin cords, and camped in cold and sometimes rainy conditions with the meagerest of meager blankets. The third day of the trek we climbed onto the massive Baltoro Glacier, one of the world's largest glaciers, over a kilometer wide and 100 kilometers long, and got lost for a few hours wandering around the gigantic crevassed terrain. Eventually we made it to basecamp, a small oasis of flat space on the Dungee Glacier (a "tributary" of the Baltoro). A Spanish team who had plans for a route on Nameless Tower were there, and we celebrated our arrival with them. Basecamp was at first a shock to our system. During the preceding weeks we had frequently become pessimistic about ever even getting there with all our gear intact, and had been focused on this moment of arrival for so long that it seemed unreal. The summits of both Great Trango Tower and Nameless Tower were visible to the north, across the glacier to the east lay Thunmo, an impressive perfectly triangular obelisk of granite, and to the south loomed the brooding form of Masherbrum. A pretty place indeed. By and by, the porters rolled into basecamp, dropped their loads and impatiently waited for their fee. Assigned financial officer of the expedition, I paid each porter his due, $50 each, and toward evening, with all business done, the porters headed back, leaving us with all our equipment and mixed feelings of commitment. The remoteness of our location seemed to quadruple as we watched the last porter leave. The next day, we immediately set to work building a kitchen and customizing our camp. The Spaniards turned out to be a friendly bunch, and during many cups of Chai, we shared food and stories, and quizzed them for info about their climb. They had ropes fixed on Nameless Tower and had been waiting out the preceding few days for better weather. Later, Toto and I made a foray into the Dungee Glacier to get a head- on view of our objective. The glacier was a maze of crevasses and moraines, and after several hours of hiking we stood below our objective, the East Face of Great Trango Tower. It was more awesome and fearful than we had ever imagined. A huge beautiful wall rising up to 20,444 feet. Snow trails were billowing from the summit, and the wall took our breath away and mesermerized us. We studied with awe the Norwegian Buttress, the North East Pillar of Great Trango, and reflected on the tragedy that took the lives of the first ascentionists. 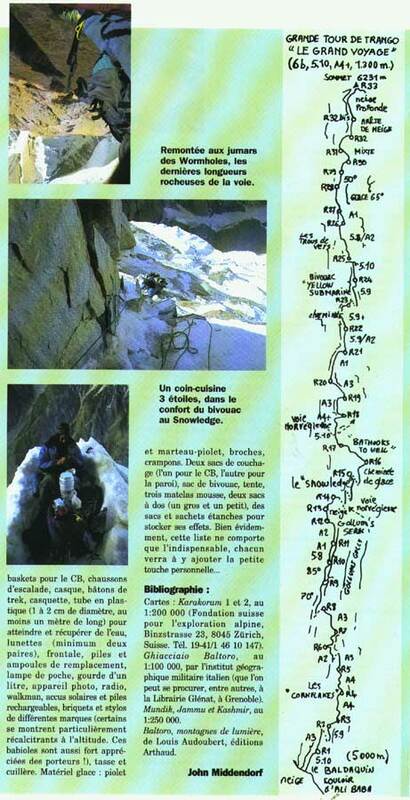 Four Norwegians in 1984 had set out to climb one of the most impressive routes in the world. After 3 weeks on the wall, their supplies were running thin and two members of the team regretfully and selflessly retreated, enabling the other two members to continue with the bulk of the provisions. The two who continued did indeed reach the summit, but on the descent, disappeared and were never seen again. Since then, the Norwegian Buttress has been attempted on three different occasions, with a Spanish team and a Japanese team making to the rim but not the summit. Toto and I planned the route, scoping the wall for new lines with binoculars. We could see several possibilities on the lower half of the wall to a giant snow-covered ledge system half way up. Above the ledge, which we refered to as "the Snowledge" (the Norwegians also used this name), there was only one possible line: a long north-facing crack system to the right of the Norwegian route. No big wall route existed yet in the Baltoro region which faced north. Would it be possible to withstand conditions in hanging portaledges on a north face in the Karakoram? We rationalized that we could always bail out onto the east facing Norwegian route from the Snowledge and concentrated on more immediate concerns. The approach to the base looked like a major climb in itself, 3000 feet of steep heavily crevassed glacier and coulior travel. Two major hanging seracs periodically calved dozens of tons of ice, which then swept down the approach. Above the second serac, a steep 1500 foot coulior led along the base of the East Face to the base of our chosen line. This coulior turned out to be a major avalanche gulley for most of the snow and ice falling off of the east side of Great Trango, and activity was non-stop during the warmer daylight hours, and occasional during the night. We named it "Ali Baba's Couloir", refering to its mostly closed nature. It definitely looked like some serious Russian Roulette getting to the base, and we knew immediately that we were in for some major night climbing. For the next three weeks, we established camps I and II, carried gear in stages to the base, sat out a few periods of unsettled weather, and climbed the initial pitches of the route. Camp I was dubbed "the Beach", because of its sunny location at 13,500 feet on a rock band above the first serac. Camp II was at 16,000 feet at the base of the route proper. We planned for 25 days and nights on the wall, and took 100 pounds of food. We brought a Markill Stormy hanging stove with 25 cannisters of butane, a MSR XGK stove with 6 liters of kerosene. Our fuel seemed adequate even if we had to melt snow for all our water (if we could find it on the ledgeless wall). Combined with our big wall gear and bivouac equipment, we had over 250 pounds of stuff. It was demanding, tedious, and dangerous getting the gear to the base. Once while ferrying loads, we got a late start at 3:30 am from our Camp I, and were not quite to Camp II when the morning avalanches began at around 7:30 am. Toto, ahead of me and nearly to the safety of Camp II, yelled, "Decide, up or down, in a minute you will die!" I scurried up and minutes after reaching Camp II, a huge snow avalanche triggered by the morning sun swept down the coulior dusting me with snow. At first, we were planning to climb as a team of four. During these toilsome days of work, however, Uli and Studi opted for a climb on Nameless Tower, which had many fine established routes and a much less serious approach. Toto and I felt fine about this, having worked well as a team of two before on some of the hardest routes in Yosemite and Zion, though we realized that our individual workloads would be greater, and that this route would be a greater challenge that either of us had ever known. At long last, we had all our gear established at the base and were ready to commit to the vertical. As we were getting the final organization done at the base, a huge rockfall came pounding down above us. Among tons of rock came two Volkswagon-sized blocks which winged over us and were swallowed by the couloir below. Great Trango speaks! Neverthless, on July 13, over a month since arriving in Pakistan, we jumared up our fixed ropes and spent our first night on the wall in hanging portaledges at the top of the fifth pitch. We were climbing in the purest and most committing form: a small team of two, with only six ropes total for climbing and for hauling. 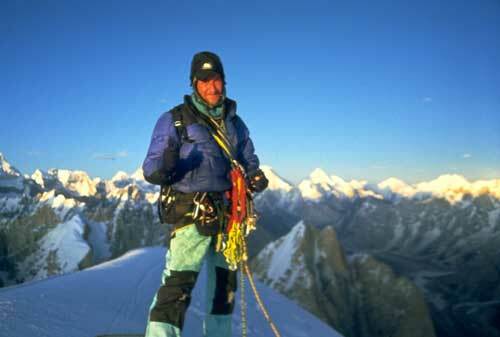 Some ascents on the biggest walls of the world have depended on extensive fixed ropes for thousands of feet, enabling the climbers to always have a speedy safety line to the base; this technique seemed too cumbersome and timid to us (also known as sieging). We knew that the next day after climbing a few more pitches we would be committed since retreat would require pulling ropes down from hard earned ground (retreating off big walls without fixed ropes is in general a serious and time-consuming proposition). We also knew that our water supply, a partially snowmelt-filled 55 gallon expedition plastic barrel, would only last about a week. We were prepared to chop ice out if the contents of the barrel froze, but until we made it to the Snowledge 2500 feet above us, we would be in danger of running out of water; dehydration can be a serious problem at altitude. Every inch of progress took us further and further from the safety of basecamp, a place we were beginning to miss very much. The climbing on the lower buttress followed tenuous cracks and flakes, with an occasional 5.10 free climbing pitch. Hooking, copperheading, expanding A4 sections joined major features. Many of the belays were in suicidal positions, due to the frequency of snow and ice and occasional rock avalanches coming from above, but we were able to find relatively safe havens for our bivouacs. We climbed in "capsule style", fixing our ropes above each camp until we decided it was safe and timely to move each camp. As I approached the end of the eighth pitch, I noticed to my left an old and tattered rope hanging out of what we later named "Gollum's Gulley". A mystery. I put in a belay and swung across the face in order to grab the rope and to get a view into Gollum's Gulley, a giant corner system full of loose rocks and ice. The rope was frozen in place and it appeared, looking up the gulley for the first time, that 1) this corner system was a major drainage/avalanche gutter, collecting the bulk of the ice and snow shed from the Snowledge, and 2) we were in for some tough and objectively dangerous climbing ahead. It looked like a suicidal proposition. Toto came up and set off into Gollum's gulley, pulling himself up the frozen rope. The rope must have been jettisoned off the Snowledge from previous parties on the Norwegian route. The rope soon disappeared into the ice and Toto began free climbing on the steep buttress to the right. Suddenly, the familiar big rumbling we had heard so often sounded close, directly above us. What felt like 10,000 softballs being dropped from hundreds of feet above hit us smack on. Toto managed to hold on and after an eternity of pain and fear, the multi-ton snow and ice avalanche passed by. We made a hasty retreat into the portaledge off to the side for some consideration of these new conditions. After some tea and deliberation, we realized that we must only climb into this 500 foot corner/gulley system at night. The next three nights we were blessed with a full moon, positioned perfectly so it shed its light directly into our gulley. The climbing was tenuous and dangerous: near vertical ice climbing, insecure and unprotected mixed climbing, and aid climbing around giant loose blocks. The belays were in awkward places, as we were forced to place them on the overhanging right wall of the gulley to avoid being in the avalanche path. At long last, we had ropes fixed nearly to the Snowledge, and on day 7 of the climb, we hauled our bags and established our first (and only) non-hanging camp of the climb on the Snowledge. The Snowledge was a thousand foot long steep ridge of snow connecting the lower Norwegian Buttress with the upper headwall. Our route connected into it directly at the base of the upper headwall, avoiding any major snow-walking. We dug out a platform, and cooked a cheese fondue to celebrate. The ability to set things down without clipping them in was a welcome relief from the previous days and nights, when everything seemed on tenterhooks in fear of dropping items. On a wall of this nature, not only the success of the route but also the survival of the players is at serious risk if even one item is dropped. Dropping a camming unit or a fuel cannister is sure to roughen the logistics but not irreparably so, but dropping a glove or a boot or a sleeping bag is at best saying goodbye to finger and toe digits, even with immediate retreat. The next day it stormed, and we gave ourselves a welcome day of rest and melted snow for water. We talked to Ace far below on our radio, which helped ease the remoteness of our home. Up here, the avalanches were less severe. Above the Snowledge, our route followed the Norwegian route for 3 pitches, then exited right up into a huge African shaped rockscar on the north face. We fixed pitches above the Snowledge until all our ropes were extended. On July 22, we left the security of the Snowledge and committed to the upper headwall. Our route at this point faced exactly north. We got a little bit of direct sun both in the morning and in the evening. The rest of the day was cold cold cold. It seemed crazy to climb on the north face of any wall of this nature in the Karakoram. On the big mountain routes, climbers can generally find reasonable shelter on a north face to protect them from the elements. But for us, our only possible shelter on the vertical wall was our 8 pound titanium A5 hanging portaledge. I had designed it for the worst possible conditions, but here, my design work was to be put to a do-or-die test. A 20 pound overdesigned portaledge would have been welcome, for we knew that portaledge failure during one of the storms would likely be fatal. After some serious aid pitches interpersed with difficult free climbing above the Snowledge, we made it to the upper chimneys, which were generally strenuous and awkward. We climbed pitches of 5.9 and 5.10, including one pitch which had several "Harding Slot" maneuvers at over 19,000 feet! The main difficulty of the strenuous climbing, however, was not the altitude, but free climbing with big boots, bulky clothes, and large protection racks. At the top of the 24th pitch, we sensed that we were getting close enough to fix ropes to the rim, and set up our final camp. We were running out of snow to melt, and we could see that we were in for some bad weather. Our portaledge was set up in a chimney, and it was difficult and cramped to move around. The next few days in stormed heavily, and we dubbed our home, "The Yellow Submarine", because of the ocean-like surroundings (wet!) and the abient light passing through the yellow rainfly. At times we felt trapped and doomed, prodding us to jump out of our portaledges at every lull in the storm, poised to go up. Once we did go up during a stormy period. The weather was raining and sleeting, but less severe than the more fierce conditions we had been growing accustomed to. "It ain't great weather, but it may be the best we get! ", was our justification. I ended up leading an 5.10 A3 section in a freezing slush waterfall which drained a large section of wall above as the heavy snows hit the wall and melted to a slushing consistency. My outerwear held up to the ultimate test. Near frozen, I rapped directly to the portaledge after finishing the pitch worried about hypothermia, but amazingly, it was only damp inside my thickly frozen expedition suit. Ace, watching from below, was amazed to see us climbing that day as we appeared periodically through the clouds. On July 27, day 15 of the climb, we awoke to a clear morning and finished the climb to the rim. The last pitch was bizaare mixed free and aid climbing in wierd overhanging slots which I named, "The Wormholes". When we got to the rim, we got the news from our companions on Nameless and pondered our situation. After rappelling back to our last camp, Toto and I got grouchy with eachother, perhaps because neither of us wanted to make the call on the next day, if it was good weather. Well, the next morning dawned as the best day yet, so almost without hesitation, we got together our ice gear, crampons, and some light summit assault gear, and jumared up our fixed ropes at about 5:00am in the morning. What looked like a few hundred feet to the summit turned out to be six pitches of difficult ice, mixed, and snow climbing. We found fixed pitons and slings from the Norwegians, verifying the likelihood of their ascent. The last section of the climb involved burrowing through thick unconsolidated snow on steep and unstable ridges, in an exhausting process of digging for 5 minutes per step. Toward sundown on July 28, we made the summit, and excitingly took pictures of everything: the beautiful view to the east towards Biale and Mustagh Tower with the big giants: K-2, Broad Peak, Gasherbrum IV, I, and II. To the South, Masherbrum. To the West, a view of some mysterious and inaccessible spires and behind, the Latok/Ogre group. And a beautiful view of Nameless to our north. Below, we could see our basecamp which we had left an eternity before. Time passed quickly, and as the sun started setting, we realized at once that we still had a long way to go and some dangerous terrain. We downclimbed sections and rapped off single pitons in a series of hasty descent manuevers, and made it back to the rim well past dark. We rappelled and pulled our fixed ropes and made it back to our high camp around 10:00pm. A long and hard day above 20,000 feet. For the next three days, we rappelled the route, getting updates from our companions who had bade it back to basecamp in a horrendus 36 non- stop hour epic. 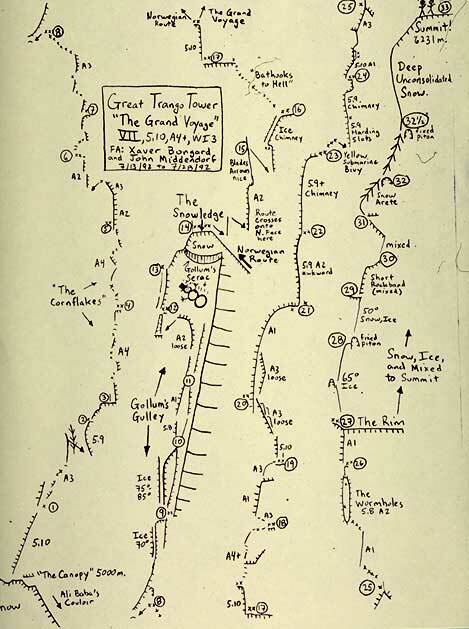 On the 18th day after leaving the base of the climb, we returned to it, only to realize that the approach gulley had become a giant funnel of tidal waves which mysteriously poured down from above at regular intervals. That day, we had tossed a haulbag full of gear including our sleeping bags and bivouac equipment in an effort to lighten our loads and in anticipation that we'd be able to cruise down the gulley and be in basecamp that night. Instead, we settled down for a cold night and waited for the slushly water avalanches to subside. All night we shivered and listened to the water avalanches pour down the gulley every half-hour or so. Neither of us had ever witnessed anything like it, almost a reverse Old Faithful. Toward dawn, we hadn't heard any avalanches for awhile, and got poised to descend. Then, one of the largest ones yet poured down, scouring the entire gulley for loose objects such that we would have been. We realized that with the warming day, the slush-falls would become more frequent, so we decided that it was now or never (literally), and made our way down. Instead of descending the gulley, which would have been suicidal, we made our way to a 2000 foot rock buttress to the east. Traversing the gulley involved rappelling down the 25 foot vertical walls of the ice on one side and ice climbing (with 100 pound packs) up the other side. The feeling of vunerability overwhelmed us during the few minutes at the bottom of the slush channel. With great relief, we made it to the buttress and began a series of rappels which led to the approach glacier. Luckily we hadn't tossed the bolt gear. After a total of 44 rappels since leaving the summit, we made it down to the glacier, only to find that the warmer days had opened huge crevasses which at first seemed bridgeless. Nearly exhausted, we crept down the glacier and finally made it to the Beach, where we joyfully celebrated our first moment of relative safety for the first time in weeks. We strolled into basecamp singing "The Yellow Submarine", elated and looking forward to drinking some Chai and eating some real food. Uli was still there, as the helicopter's arrival was delayed by a period of fighting in the nearby Kashmir. He wasn't packed and rationalized his disorganization with the statement, "I've been waiting for days, surely the helicopter will wait 20 minutes for me!" Ace and I tried to convince him that maybe it doesn't work the same here in the third world as it does in the European Economic Community, but to no avail to Uli's proud insistence. Well, the next day, the helicopter came unexpectingly, and in the chaos of hurricane winds, noise, and spitting dust, the helicopter set one skid down, spit out a crewman who grabbed the first man he saw with a bandage on his ankle, and prepared to leave. Everyone was incapacitated by the sudden and overwhelming maelstrom, but somehow in the confusion, I grabbed the first bag I could find and tossed it into the same doors that had swallowed Uli. Luckily, it had contained his clothes and passport, all he had on were pants and a t-shirt. When silence finally came back to our camp, we all looked at eachother, shellshocked, and suddenly broke into fits of laughter. The camp was strewn about, tents and papers and expedition gear and clothes spread everywhere. Somehow the separate reality of our life the preceding months instantly became obvious, and already the memories of the wild times we had spent on Great Trango began to fade, as we began instead to focus on going home. Click here to read Xaver's version of this wild adventure.